This semester I decided to take Kuwait Politics & Government so I could learn more about how government works in the gulf region and understand the system in Kuwait in case I plan to do business here someday it is good to know. I also wanted to learn more about Kuwait in general and politics and government was a great place to start, and my experience at American University of Kuwait where I was very active in the community and with Model United Nations also inspired me to learn more about political science in general. I remember when the members of parliament were drilling the Minister of Kuwait and many of us AUK students went to the steps of parliament in support of her. But never did I imagine that this Kuwait politics class would compliment my internship with Equilibrium and my passion for environmental sustainability like it has. It all began when I was learning in the class about the Legislative Branch of the Kuwaiti government and the Parliament and its committees. It is made up of about 11 permanent committees and about 8 ad-hoc or temporary committees. I noticed that the environmental committee was temporary. I found it strange that it would be a temporary committee, as if the environment is only an issue sometimes. I asked myself why isn't it permanent when there exist so many environmental issues in Kuwait? I knew there was the Environmental Public Authority on the Executive Branch side, but where was the voice for the people in parliament with regards to the environment? I later learned that the last time this committee was active was in 2006! It would seem that it was made just to put out fires, but when it comes to addressing environmental issues, being PRO-ACTIVE is the most efficient (in all senses of the word) way to go. 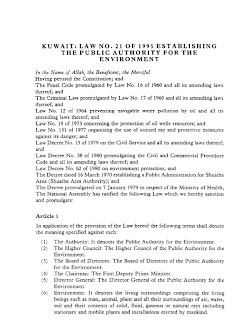 It is true that there are many important aspects of Kuwait that the parliament has failed to address well and that many of the committees have major issues, but as one MP himself commented, "the Environment Committee never convened even once." Soon after learning about the parliamentary structure in Kuwait, the emir historically dissolved the parliament as is his constitutionally given right to do. This happened for many reasons including that the MPs were not cooperating with the Ministers and as a result many issues were not being resolved. When the emir dissolves parliament, according to the constitution, they must hold elections for new MPs within 3 months. It was very exciting to see the whole process first-hand. I took advantage to do my best to spread awareness about the environment in Kuwait and getting voters to ask their candidates about the environment and to vote for candidates who had knowledge about this and to push for an environmental committee. For our class project, we had to select a committee and relate a topic from it to Kuwaiti policy and debate about it. My partner and I chose this environmental committee and planned to debate about whether or not the environmental policy in Kuwait needed to be improved. We had to do research for this project but we soon came to realize it is very hard to find any real data on the environment. Few organizations and government agencies are willing to share with others this information, possible for fear it will be later held against them in one way or another. Sadly this is the wrong mentality to have about this information. It should be accessible by all through a common database so change can happen and improvements on the situation can be made. It is hard to make change when the supporting data to show that there really do exist serious issues cannot be accessed. This became a campaign for us. We spent hours online and going around to various advocacy groups, companies, parliamentary candidates, professors and government organizations trying to piece together some information about Kuwait's environmental situation. After our work, I ended up creating a five step policy proposal for legislation as a part of my presentation for the class. I also included an short video slide show on Kuwait and the environment, which you can view at the top of my blog. May this new Parliament be the best yet. But it will also depend on how active the people of Kuwait are in holding them accountable and not just in sitting in on the parliament but making sure to keep tabs on the MPs as well. The point of the parliament is a link between the people and government, so the people still play an active role in this and the MPs are merely the representatives of the people, so it is essentially a team effort.